Masked Minted Lamb RissolesYou could also use leftover lamb! This easy to cook and healthy Masked Minted Lamb Rissoles is perfect for the holiday season, for your weekly house parties or even for your daily dinners. You could also use leftover roast leg of lamb and gravy to make these meat patties. The term rissoles comes from the French “rissoler” (which means ‘to brown’) and also refers to fried turnovers with savoury fillings. Place the lamb mince in a large bowl with the onion, breadcrumbs, mint, cumin, feta and a generous pinch of salt and pepper. Using your hands mix until fully combined then divide the mixture into 8 portions. Roll each portion into a ball and flatten slightly. Place on a tray, cover and refrigerate for 15 minutes. Heat a large frying pan or grill over medium heat, brushing with a little oil. Cook the rissoles (in batches if necessary) for 3-4 minutes each side until cooked through. Remove and drain on paper towel. Serve rissoles with tzatziki, warm pita bread and a Greek-style salad. 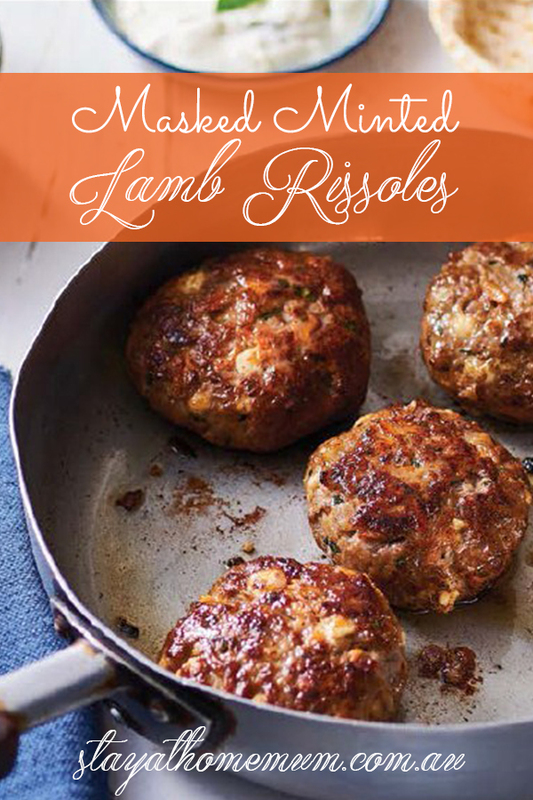 For this Masked Minted Lamb Rissoles recipe, try rolling the rissole mixture into smaller meatballs for a great party snack, serve with tomato relish or spicy sauce.